CROSBY  Two suspected drug dealers from Barrett Station with a gun in their Cadillac against deputies with drawn pistols allegedly, put some excitement in last Thursdays Main Street drive home beginning at 2:49 p.m. According to Lieutenant John Denholm of the Harris County Sheriffs Homicide Division, a buy bust, (an undercover narcotics officer attempts to purchase illegal substances then other deputies close in to make and arrest) turned violent. Denholm stated that the suspect vehicle hit an undercover officers car, then two deputies on foot, followed by hitting the marked vehicle, before crashing into the black truck. Two deputies were hit and slightly injured by the Cadillac and then it rammed a marked patrol car resulting in another officers shoulder being injured. The patrol car was spun around. The final crash was after multiple shots were fired into the Cadillac. Two of the deputies waited until after the walk through to go to the hospital. Crosby Medics for ESD#5 took the other by ambulance to Hermann Hospital. Three deputies opened rapid fire hitting both suspects and a couple of nearby cars, the two suspects were flown by Lifeflight to Hermann Hospital. After a hearing in the 338th District Court on August 28 more information came to light on the suspects. Yantsey Gonzales, 29, of Magnolia Street, according to Denholm, has eight prior arrests including possession of a controlled substance. Gonzales is currently in the hospital and on parole. A motion to revoke his parol has been made by the state Department of Corrections. He has been charged with Possession of a Firearm and Possession of 200 to 400 Grams of a Controlled Substance, namely cocaine, and Delivery or Manufacture of a Controlled Substance. Charles Ray Lewis, 21, of Pecan Street, has been charged with Delivery or Manufacture of a Controlled Substance, Aggravated Assault of a Public Servant, and has had three prior arrests. Lewis is being held on a No Bond. at 1200 Baker Street after he was released from the hospital. This Officer-Involved in a Shooting is being investigated by the Harris County Sheriffs Office Internal Affairs Division, the Harris County Homicide Division and the Harris County District Attorneys Office. CROSBY  The funds, raised at Tough Enough to Wear Pink night at the Crosby Rodeo have been designated for breast cancer research. 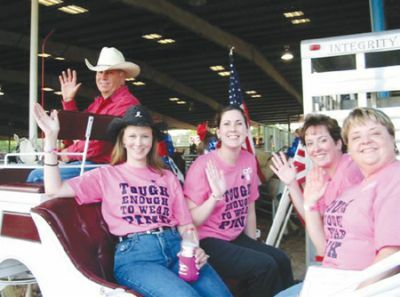 This year the toughest guys and gals wore pink shirt including rodeo participants for the first time at the Crosby Fair & Rodeo on June 9. Those that wore the shirts were counted and sponsors donated funds to match that number to go to the American Cancer Society. Recently, Shirley Rogers of the Crosby Fair & Rodeo handed a check for $2,500 to Michelle Hicks of the American Cancer Society, on hand for the check presentation were Belinda Berger, Community Resource Credit Union, M.A. Bengtson, San Jacinto Methodist Hospital and Halena Hellums, Director of the San Jacinto Methodist Cancer Center. To raise the funds, Community Research Credit Union and San Jacinto MH kicked in 50 cents each for every pink shirt that came through the gate on the night of June 9. Added to that was a donation of $400 from Crosby Fair & Rodeo and the public for a total of $1,196. To make it to the $2,500 goal (needed to dedicate the contribution to research,) San Jacinto Methodist Hospital kicked in another $1,304. According to the sponsors, the event will be repeated at the rodeo in 2007 with even greater success predicted. Monday, August 21, with the cooperation of Ms. Dorie Butterworth of Crosby ISD textbook procurement (at right) Highlands Rotary Club members Sam Al Rasheed, Charley Ward, president Johnny Gaeke, Robert Woodall, and past President Steve Miller loaded up eight 4x4x4 pallets of old text books to ship to Africa, along with 13 pallets with Baytown. HIGHLANDS/CROSBY  Local Rotarians are providing the means to answer the literacy needs for impoverished areas throughout the world. 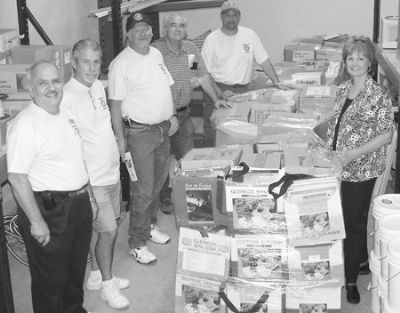 With the ideal that the rest of the world does not have many of the advantages we tend to take for granted in this country, several local Texas Rotary Districts undertook a project to collect books and ship them to places of need. CROSBY While each of Crosby ISDs campuses received Academically Acceptable from the TEA (Texas Education Agency) based on their 2006 TAKS (Texas Assessment of Knowledge and Skills), Crosby High School failed to meet criteria established under the federal No Child Left Behind Act. A preliminary report from the TEAs Office of Accountability and Data Quality for (AYP) Adequate Yearly Progress showed that the high school missed the performance level in mathematics. District Superintendent Dr. Don Hendrix said he was not surprised by the report. The campus, he said, has trouble with the passage rate among African American students and the report just proves what they have already knownthat more work was needed. The AYP looks at the areas of reading/ language skills, mathematics and graduation/ attendance rates. District wide, Hendrix said, Crosby did well coming just a few students from hitting the TEAs Recognized status. The test results, he added, gives the district guidance and where extra focus needs to be made. According to the TEAs report in mathematics, Crosby had a 44% passage rate. With 176 students in that group taking the test 11 more would have broken the 50% plateau. African Americans werent the only group with math troubles. Economically Disadvantaged students had a 40% passage rate in math. Hispanics students had a 49% passage rate, just two students away from the 50% mark. Hispanics were also the only group to show improvement from 2005, with the passage rate going up 4%. While a failed to meet criteria will not cost Crosby federal funds, Hendrix said that it is an important tool in focusing their efforts. To help students, Hendrix said they will begin hosting after school test sessions to help students prepare for the tests. We are going to do what we can, but in the end the students have to step up and pass the test, he said. Mike Joseph, the assistant superintendent for instruction, said that they have also set up teams of four teachers who work with groups of students to give extra instruction in the testing areas of math, reading, writing and social studies. The high school has also created a separate ninth grade lunch to help students transition from junior high to school as well bring them together for study sessions. While Huffmans Hargrave High was found Unacceptable by the TEA based on scores by its Special Education students, as a whole the high school met federal AYP criteria in all areas. The same could not be said for Baytowns Lee High School, which failed to meet criteria in both reading participation and math participation and performance. Under the criteria, districts are required to have 95% of special education students take the tests. This year, Lee had 92% take the tests, or a lack of two students. The 14th Year Anniversary Clearance Sale was held from August 17 through 19. Special incentives and discounts were in effect for the period. I have a lot of friends Ive made during the past few years, and I cant think of a better way to say thanks than to put them in the new car they deserve…regardless of credit problems or hard times, said John Keating. 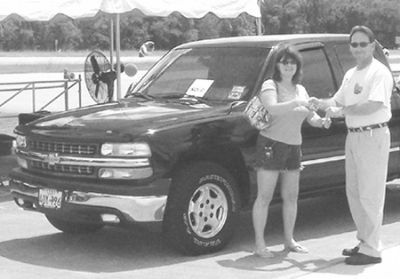 At last Saturdays event, the dealership offered hamburgers, hot dogs, and soft drinks with a background of Rock and Country Music played by local talents Crazy Train. Customers dropped by in waves. The Pilot Club of Highlands installed its new officers for 2006-07 recently at The Teapot Dept in Highlands. 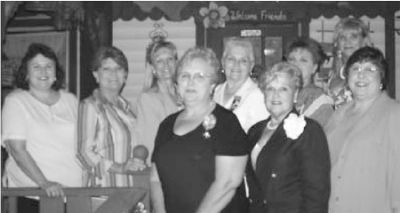 Pictured, front row from left, are Laura Dean, president; Janette Walker, president-elect; Susan Precht, vice- president; back row, Becky Baumbach, director; Dehlia Mulllins, director; Sue Norris, director; Barbara Reeves, treasurer; Shyanne Melton, corresponding secretary; and Susan Kalke, recording secretary. 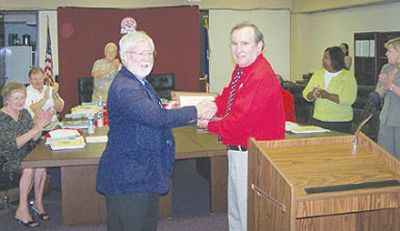 CROSBY  The school board gave plaques and certificates of merit to local media representatives, staff and educators at their August 21 meeting. In addition to the regular business and problems tackled by the school board, they awarded a Crosby ISD Media 2006 Honor Roll to Gilbert Hoffman, Publisher of the Star-Courier and to David Taylor, editor of the Sentinel. With that recognition the board then honored In-Service Staff contributions with certificates and of course pay for the extra work. The first certificate awarded went to Ms. Deloise Richardson and Ms. Ann Hill 5th and 6th Grade Language Arts Teachers for their Guided Reading presentation. At Summer conferences Crosby was well represented. Patricia Franta, Karen Walthall and Francis Tisdale made presentations at the biggest Math Conference in the state. Lynda Kubin and Rosanne Joseph presented Sharing the Workload at the TCASE Conference. Staff development required special attention to development of reading skills in the lower grades. Suzanne Day, Rosanne Joseph, Kim Houser, Barbara Barrett, Nancy Stephens, Gail Bartz, Carol Swenson, Asa Kinnebrew, Debbie Vincent, Phyllis Gilliam and Renee Guillory were specially recognized for Implementations: Small Group Phonics in grades Kindergarten through Third Grade.